I'm one of those people who canceled my cable subscription several years ago and relies completely on the internet for all of my video consumption. I had a mac mini hooked up to the TV (since Roku hadn't really caught on at that point) to stream Netflix and watch YouTube. To avoid sounding like a total hipster (I canceled cable before it was cool) I'll just get to the point. I watch a lot of YouTube. So much, that when they released YouTubeRed, I immediately threw my wallet at my computer screen shouting, "Take my money!" The ads aren't really that bad, but I like avoiding that extra click 5 seconds in on every single video. I learned everything I know about quilting from the Missouri Star Quilt Company's channel and upped my makeup game with Kandee Johnson. I've learned quite a few skills through watching YouTube, so it only seemed natural that I seek out advice on writing and publishing on the Tube. Since I started writing, there have been quite a few great channels pop up on the subject. I thought I'd share some of my favorite writing and author channels with all of you. There's a reason I put Kristen at the top of my list (and no, we're not related). It's because she is a serious professional. She has videos detailing all the aspects of self-publishing along with sound advice on writing. All of her videos are thoroughly researched and straight to the point. On top of that, she's serious about her writing career and has released three books in less than three years. If you watch only one AuthorTube channel, make it this one. Kim's bubbly personality is infectious. Watching her channel always injects me with a big dose of optimism. As an English teacher and mother, she proves that anyone can reach their dreams. She's also incredibly honest about the stresses associated with trying to get published. I can't wait until her debut novel comes out next year. Bookish Pixie is a no-nonsense channel of writing advice. There aren't too many trade published authors talking about writing on YouTube, so Ava has a refreshing and different perspective than the other authors I watch. Her videos are short and to-the-point making her channel excellent for binge watching. Travis's WritingTips were some of the first writing videos I subscribed to. He has a voice of authority and has been writing long enough to know his stuff. Most of his content is rapid fire writing tips, so you'll learn a lot from even a single video. He also has a small menagerie of fluffy animals who sometimes sneak into his videos. I couldn't make a list without including the self-proclaimed cyborg. I wasn't a big fan of her first novel, but that doesn't make her writing advice any less sound. She's incredibly entertaining and delightfully foul-mouthed. Even people who don't write will love watching her channel. Chris is a full-time self-published author. He isn't afraid to talk about how money matters and the costs of marketing and publishing—figures most writers refuse to disclose. And since he's a successful author, you know his advice works. His videos are geared to those who want to make publishing their career and will help you write as a professional. Every writing list should include Mandi Lynn. She published her first book at only 17 which is amazing. She's still writing and doing new videos while also attending college. Shaelin is another young writer who's drafting novels while working on her degree. She talks about the numerous novels she's working on although they aren't yet available for fans to read. She's candid and a little more off the cuff than other writing channels and is definitely worth checking out. Megan's channel is pretty new, but I still wanted to include her. As a budding author with her debut coming out later this year, she's a writer worth following. She strives to put out quality content which is apparent in everything she does. I'd recommend his website over his YouTube channel but both are worth following. He's experimented with quite a few publishing strategies and shares what works (and willingly admits to what doesn't). He's a little eccentric (he's the guy who rented a French castle for NaNoWriMo last year) but the best people are. 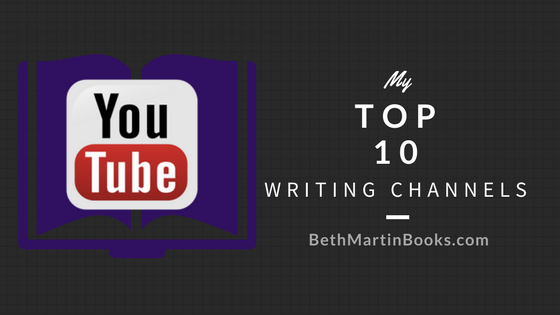 I'm stopping at ten, although I'm sure there are many other great writing channels that didn't make my list. What other writers making videos do you like to watch? Let me know!